Surely the fifth and eighth chapters of the Romans epistle were in Charles Wesley's mind when he penned the words to this great hymn of the church. 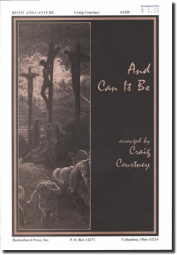 Craig Courtney has taken those verses and set them in a dynamic opening of driving rhythms and mixed meter to prepare the choir and congregation theologically and musically to sing And Can It Be with new-found conviction. There are many times you could use this anthem throughout the liturgical year, but consider using it as a "big" anthem during the Lenten season, the season when most music is characteristically slow and somber. A full score and parts for brass sextet and percussion (BP1535A) are available.